Pilates can play a major part in helping us being “fit to perform to the best of our ability”. Specific Sport related Pilates Courses are available – please contact charlotte@live-pilates.co.uk or call me on 07801 444825 to discuss your club/or individual needs. To go to any section click on the sport you require information about below. 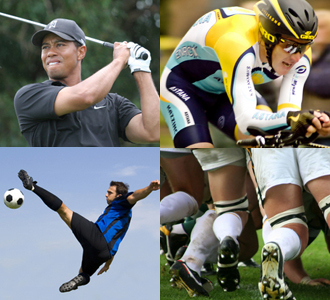 To be successful in sport you firstly need talent and technique. We are born with talent. It is our potential. As we know some have more of it than others, for example David Beckham, Lance Armstrong and Tiger Woods to name a few. Technique is the know-how of how to perform the sport successfully. We get this through training, coaching and focusing on particular skills of the individual sport. Every sport has its own distinct movement pattern. Many sports are unilateral (predominately using one side). Take golf as an example, where you are rotating the spine and hitting the ball one way only. This places enormous strain on the lower back. Other sports demand biomechanical efficiency to minimise the potential damage caused by an action, such as fast bowling in cricket. Impact sports like rugby and football require a high level of conditioning and strong focus around certain joints to give flexibility and mobility. All athletes want to build longer, leaner muscles without adding the bulk and to learn how to activate the deep abdominal muscles to give a solid core. Pilates hits the spot for all these requirements and is an excellent way to complement other sports and training methods. Focus should be taken on building up the weak muscles to make you stronger. If there is an unbalance in the body this brings about weakness which may lead to an increased risk of injury. Professional and amateur athletes are using Pilates as part of their training programme to give them the edge over their competitors as they will be internally more balanced, recruiting the correct postural muscles, which in turn will help prevent injury.